Where in the world is Billy Battles? As Book Three of the Finding Billy Battles trilogy begins we know where Billy is. He is in Chicago with his wife, the former Baroness Katharina von Schreiber living a sedate and comfortable life after years of adventure and tragedy. That changes with a single telephone call that yanks Billy and Katharina back into a life of turmoil and peril. Persuaded by a powerful old friend to go undercover for the U.S. government the two find themselves in Mexico during the height of the violent 1910-1920 revolution. There they encounter assorted German spies, Mexican revolutionaries, devious political operatives, and other malefactors. Caught in the middle of the 1914 American invasion of Veracruz, they must find a way out while keeping their real identities secret. After managing to extract themselves from danger, disaster strikes. It is a tragedy Billy is all too familiar with and one that will send him plummeting into a painful abyss of despair and agony. Consequently, Billy vanishes leaving family and friends to wonder what happened to him. Where is he? Is he dead or alive? What provoked his disappearance? In Book 3 of the Finding Billy Battles Trilogy, those questions are answered, and the mystery behind Billy’s disappearance is finally revealed. 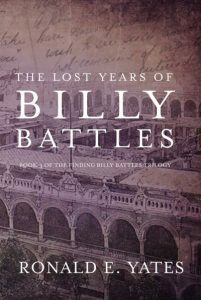 The Finding Billy Battles series tells the story of a man who is born in 1860 and who dies in 1960. In between William Fitzroy Raglan Battles lives an improbable and staggering life of adventure, peril, transgression, and redemption. Then, Billy (that’s what his friends call him) mysteriously disappears. For several years his family has no idea where he is or what he is doing. Finally, with his life coming to an end, Billy resurfaces in an old soldiers’ home in Leavenworth, Kansas. It is there when he is 98 that he meets his 12-year-old great-grandson and bequeaths his journals and his other property to him — though he is not to receive them until he is much older. Years later, the great-grandson reads the journals and fashions a three-volume trilogy that tells of his great-grandfather's audacious life in the old west, as well as his journeys to the Far East of the 1890s—including French Indochina and The Philippines—and finally, in the early 20th century, to Europe and Latin America where his adventures and predicaments continue. Trouble and tragedy dog Billy his entire life. In each book of the trilogy, we witness Billy’s ability to handle setbacks and misfortune as well as his successes and relationships. Each chapter in the trilogy blends historical fact with fiction. The chapters are meticulously researched down to the last detail so readers not only find themselves immersed in a compelling story, but are exposed to historical events and real people that make the worlds of the late 19th and early 20th centuries come alive. Before writing the Finding Billy Battles series, I spent some 27 years as a foreign correspondent for the Chicago Tribune. During that time I lived and worked in Asia and Latin America, including most of the places in which my books are set. Therefore, descriptions of cities such as Saigon, Singapore, Manila, Hong Kong, Buenos Aires, Veracruz, etc. are based on my personal experiences and observations. During that time, I covered several wars, revolutions, and popular uprisings which greatly aided in the descriptions of conflict that occasionally arise in the trilogy. My purpose in writing the series was to tell a compelling story that, while fiction, is grounded in accurate historical fact. As such, I was careful to use the vernacular of the time and to describe places and events as they were in the late 19th and early 20th centuries. There is no great literary message in the books, other than to demonstrate that many people in the past lived remarkable lives filled with adventure, sadness, struggle, joy, and love just as today. They were not, as so often portrayed in the pallid black and white photographs of the time, stiff, lifeless figures without vivacity and depth. The Finding Billy Battles series is targeted at readers who enjoy historical fiction topped off with a generous helping of action and adventure. It takes readers to an earlier time devoid of the relentless intrusion of today’s technology. People who lived during Billy’s prime were not dominated by and yoked to technology the way, so many of us are today. It was a time when the notions of “honor,” “fidelity,” and “duty” were guiding principles in most people’s lives. People were less harried and stressed and more disposed to stop and smell the flowers than their 21st-century counterparts. If there is one message, my books have it is this: Reading a book is a lot like life; you live it one page at a time. You would think when a man entered the sixth decade of his life that he would be settled and reasonably contented. I thought I was that man. I was wrong. When I turned fifty in 1910, I was living comfortably in Chicago with my wife, Katharina, and my daughter, Anna Marie. I had a fulfilling job as an assistant managing editor at the Chicago Record-Herald. We lived in the city’s Astor Street District in a magnificent three-story Germanic-style manor on Schiller Street that Katharina inherited from her German parents. Life was good, but as I was about to learn, it was too good to last. Trouble was a constant companion in my life. It began more than thirty years before when I was just 19. Two companions and I were forced to defend ourselves against a clan of criminals that was squatting on my family’s homestead in western Kansas. In the skirmish, I accidentally shot and killed the malevolent matriarch of the band when she unintentionally stepped into the line of fire. Then, one of my companions killed one of her two sons. Consequently, the clan spent the next ten years pursuing me and almost killed me one morning in Denver, Colorado. After I recovered from that gunshot wound, I realized I had to finish the vendetta once and for all or spend the rest of my life looking over my shoulder. With my cousin, Charley Higgins, and a posse of vaguely deputized men, we tracked the deadly clan to New Mexico and then back to western Kansas where we fought a pitched battle. I was wounded again, but when the smoke cleared, the clan was permanently eliminated. At last I was sure my life was finally on track and moving toward a little happiness. As my cousin Charley used to say when life was going tolerably well, I was “steppin’ as high as a blind dog in tall grass.” But it wouldn’t last. My wife, Mallie, passed away from the influenza epidemic of 1894, and I was so miserable that I cut my picket pin and drifted to the Far East, leaving my four-year-old daughter, Anna Marie, with my mother. I know today that it was an unpardonable act, but at the time I wasn’t thinking rationally. I wound up in French Indochina during the first anti-French rebellion by the colony’s indigenous people. A few years later I was in the Philippines. While there in 1898 and 1899, I found myself reluctantly serving as a captain in the US Army—first fighting the Spanish and then clashing with Filipino insurgents in the Philippine-American War. I managed to come through both scraps relatively unscathed. But perhaps the most significant event during that stage of my life was my marriage to the Baroness Katharina von Schreiber. We were married in the Philippines, and I am convinced that it was the most providential decision I ever made. I could count on Katharina to keep me on a tight rein when I had a tendency to react too quickly to a slight or a confrontation. But more than that, we were perfectly matched, and not many couples can say that. So, here it was, 1914, and the world was changing in ways I never imagined possible twenty years before when I was in the Far East. In August of 1914, the Great War began in Europe. Newspapers were chockablock with stories of men dying by the hundreds of thousands every month on the bloody trench-furrowed battlefields of France and Belgium, their lives squandered by generals imprudently employing nineteenth century tactics in a twentieth century war with its merciless mechanized weapons. America initially remained out of the fray, and there was no reason to think that we would ever get involved in Europe’s conflict. As for me, I had no intention of ever again firing a shot in anger. That all changed one Saturday morning in mid-March 1914 when the telephone rang while Katharina and I were having breakfast. “William Battles?” the voice on the other end asked. General Funston? I thought to myself. What could he possibly want with me? When I first met Frederick Funston in 1898, he was a colonel and in command of the storied Twentieth Kansas Volunteer Infantry during the Spanish-American War and the ensuing Filipino insurgency. I had sailed to the Philippines to assist Katharina’s brother, Manfred, who operated a lumber export business there and who had been arrested by the Spanish authorities just prior to the outbreak of war between Spain and the United States. After securing Manfred’s freedom, the general in charge of American troops in the Philippines persuaded me to accept a temporary commission as a captain and serve eight months as a liaison officer between him and the Twentieth Kansas Volunteer Infantry. That’s how I came to serve with Funston. Funston was a five-foot, four-inch package of ferocity and fearlessness who relentlessly led his men into battle waving his hat and yelling, “Follow me!” He seemed impervious to harm, and eventually his men began calling him “Fearless Freddy,” out of awe and respect. “Who is it?” Katharina asked as I held the phone to my ear. In fact, Funston had served three years as Commander of the Department of Luzon in the Philippines and then was briefly shifted to the same role in the Hawaiian Department from 1913 to 1914. Now he was back in the US where he was a brigadier general in charge of the US Army’s Southern Department along the Texas-Mexico border. Then it dawned on me. He was probably inviting me to come to the Texas-Mexico border to write about the ongoing bandit war that had been raging there since the outbreak of the Mexican Revolution in 1910. Funston was adept at acquiring newspaper exposure. I was about to mention that to Katharina when the phone crackled, and I heard Funston’s familiar voice on the other end. “Captain Battles,” Funston said, “are you hale and fit?” It was not an unusual way for Funston to begin a conversation. “My help? In what way?” Now I was intrigued. By now, Katharina was standing next to me, her ear close to the receiver. She backed away a few steps and shook her head. “No, William. No,” she whispered. I put a finger to my lips and held my hand over the mouthpiece. “By all means, bring Katharina with you. Eda would love to see her again.” It was as if Funston could see Katharina standing next to me indicating her annoyance with his entreaty. After several unsuccessful attempts to wheedle more information out of Funston, Katharina and I reluctantly agreed to take the train to San Antonio two days later. The next day I advised the paper’s editor–in-chief that I was going to San Antonio to spend time with General Funston and to gather information for a series of stories about the ongoing problems along the US-Mexico border. We took Illinois Central’s “Panama Limited” to St. Louis, switched to the Missouri-Kansas-Texas Railroad’s “Texas Special,” and arrived in San Antonio on the afternoon of the third day. When we stepped from the train we were met by a lieutenant named Walsh and a sergeant named Lopez. They ushered us to an open-air Dodge Brothers touring car. As Katharina and I settled into the backseat, she wondered out loud about our luggage. “We are bringing it by truck to General Funston’s quarters, ma’am,” the lieutenant said. “My God, we don’t have that much luggage, do we?” Katharina asked. The car lurched forward as the sergeant put it in gear. The lieutenant smiled and then turned back to me. “Another problem?” I leaned forward in my seat. “I best let the general tell you about that, sir,” the lieutenant said. Several minutes later we arrived at the gates of Fort Sam Houston. Funston’s quarters turned out to be a substantial white, two-story house with wraparound verandas on both the first and second floors. As our car pulled up, the general’s wife, Eda, was sitting in one of several green rattan chairs on the front porch. When she saw us, she put down the book she’d been reading and hurried toward our car. Eda was a stunning and spirited woman in her late thirties, some twelve years younger than Katharina. She was about an inch shorter than the general with coffee-brown hair and intense hazel eyes that flared when she talked. The last time I saw her was in 1910. She and General Funston had dinner with us in Chicago on their way to Manila where he had been appointed governor-general. Like Katharina, Eda’s parents, Otto and Teresa Blankart, were German-born. Both were accomplished musicians and music teachers. Eda grew up in San Francisco where the Blankart home was a magnet for musicians and music. In fact, her father established the city’s first string quartet, and Eda developed into a gifted musician. “What about me?” I asked, feigning a fit of piqué. “Well, as long as he’s useful I guess I’ll keep him around a while longer,” Katharina said. The Funston house was expansive, to say the least. Just off the main hallway was a forty-by fifty-foot parlor dotted with islands of couches, chairs, and coffee tables. I was marveling at the size of the chamber when Eda grabbed my arm. The room she led us to was a smaller, screened-in back porch overlooking countless trellises of red, yellow, and pink roses, a dozen or so queen palms, and several beds of flowers. Moments later, a Mexican woman appeared with pitchers of iced tea and lemonade. “We have something stronger if you prefer,” Eda said, looking at us. “Not for me,” Katharina said. I concurred. We talked a few minutes more. Eda updated us on their activities during the past four years. Moments later we heard the front door open, and the sound of Funston’s stentorian voice immediately filled the house. Eda grinned and winked at us. “You’ll just have to come find us,” she said. “And you won’t today, either,” Funston said as he entered the room, a broad smile on his face. He was dressed in khaki pants and tunic with a single gold star on both shoulders, signifying his rank as brigadier general. He walked directly to Katharina, who was standing next to Eda, and hugged her. I couldn’t help but be amused. At five feet, ten inches, Katharina towered over Funston, and the scene reminded me of a boy in a soldier suit hugging his mother. Eda looked at me and smiled as though she knew what I was thinking. “Hello, my dear,” Funston said as he hugged Eda and kissed her on the cheek. I had, and I acknowledged as much. “Too much German food,” I said. When I last saw Funston in 1910 I weighed about 198 pounds. Not bad for someone six foot, four inches tall. Now, I weighed close to 220 pounds. “And not enough physical activity, I’ll wager,” Funston said. “Possibly,” I replied. Funston had put on a few pounds himself and didn’t look at all like the man who had run wildly through six-foot-high blades of cogon grass in the Philippines chasing insurgents and urging his men forward. She wasn’t jesting. Dinner consisted of Rouladen, a roulade of bacon and onions wrapped in thinly sliced beef; Semmelknödel, dumplings made with flour and cubes of bread; Leipziger Allerlei, a vegetable dish of peas, baby carrots, white asparagus, green beans, and broccoli; and for dessert, coffee and Prinzregententorte, seven thin layers of sponge cake interlaid with chocolate buttercream and a topping of apricot jam, all covered with a dark chocolate glaze. “Na ja, du hast dir den Bauch vollgeschlagen,” Katharina said to me after I put the last of the Prinzregententorte into my mouth. Eda chortled at that. Both she and Katharina often spoke in German, and to hear Katharina accuse me of stuffing myself made her laugh. Funston and I walked a few minutes and entered a white gazebo. The two of us settled onto a bench. Funston cleared his throat. I looked at Funston with a puzzled expression, but before I could respond, he continued. I didn’t know it at the time, but, as my mother used to say, I was about to go up Fool’s Hill on the slippery side.